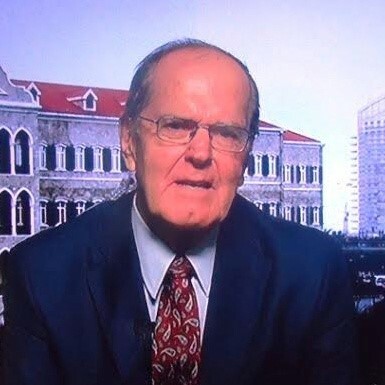 The Syrian Law Journal took great interest in interviewing Dr. Franklin Lamb whose political, legal, journalistic and writing career is worth highlighting in light of his ongoing visits to Syria. Dr. Lamb holds distinguished degrees from universities in the United States, the United Kingdom and The Netherlands including BA and law degrees from Boston University, a Master of Law and a Master and Doctor of Philosophy from the London School of Economics as well as qualifications from the University College London, Harvard University, Cambridge University and The Hague Academy of International Law at the International Court of Justice. He has served as the Assistant Professor of International Law at Northwestern College of Law in Portland, Oregon, as the Assistant Counsel to the US House of Representatives Judiciary Committee, a member of the Democratic National Committee and of its Judicial Council alongside California Congresswoman Nancy Pelosi, and finally on the presidential campaign staff of the late Massachusetts Senator Edward M. Kennedy. 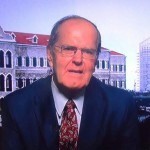 Dr. Lamb has extensive experience in Middle East politics and has traveled widely throughout Syria since 2013. His primary concerns have been to document, photograph, research and help preserve Syria’s vast and endangered archaeological sites. He was one of the first journalists to enter Palmyra after the eviction of ISIS. He is also deeply committed to rescuing and aiding Syrian refugee children in both Syria and Lebanon. In this respect, he is one of the founders of the Lebanon, France and US-based initiative Meals for Syrian Refugee Children, Lebanon. Given his insight into the Syrian war, the Syrian Law Journal sought to learn about Dr. Lamb’s experiences and what he perceives to be the legal ramifications stemming from this conflict. You have held a number of considerably high-ranking positions including being the Assistant Counsel to the US House of Representatives Judiciary Committee, a member of the Democratic National Committee during the administration of President Jimmy Carter and serving on the presidential campaign staff of the late Massachusetts Senator Edward M. Kennedy. Could you please tell us a little about those previous roles, what duties you undertook and how they eventually led to your interest in Syria? Early in my work in Washington after returning from graduate studies in the UK, I served on the Judiciary Committee of the US Congress, where my supervisor was Congressman John Conyers, who after all these years still serves in the House of Representatives from Michigan. Conyers was interested in Palestine and sometimes we would attend Middle East conferences or meetings in Washington, some of which were organized by the Arab League and its ambassador in Washington, Dr. Clovis Maksoud, who, along with US Senator James Abourezk, (of Syrian-Lebanese background), became my friends. I made my first visit to this region, and met with Syrian officials in Damascus and in Beirut following the July 17, 1981 Israeli attack on Lebanon. Israel’s attack in the Beirut area centered mainly on predominantly Muslim districts in the Fakhani area west of the city (including the Sabra and Shatila areas) and killed approximately 300 civilians. Nearly a year later, Dr. Maksoud asked me to organize a Congressional delegation to Beirut shortly after the June 1982 Israeli invasion. En route to Beirut, we spent a few days in Damascus meeting with officials and Syrian citizens. After meetings with Palestinian leaders Yasser Arafat and Khalil Al-Wazir (Abu Jihad) among others in Beirut, and seeing firsthand the destruction and devastating results of the Zionist aggression, I sought and was granted permission by Congressman Conyers and Dr. Maksoud to stay on in Beirut after the Congressional delegation returned to Washington. I spent the summer in Shatila Camp and Fakhani compiling the volume Israel’s War in Lebanon: Eyewitness Chronicles of the Invasion and Occupation, which was published in early 1983. On my way back to Washington, I again spent a few days in Damascus and discussed my experiences in Lebanon with students at the University of Damascus, among others. On returning to Washington– with many photos I had taken during the 1981 and 1982 Israeli attacks and occupation– I organized, over strenuous objections from the Israeli lobby, a photo exhibition that was held in the US Congressional Sam Rayburn Office Building across Constitution Avenue from the US Capitol. The photo exhibition included large posters with the names of hundreds of victims of the Israeli attacks and was attended by many members of Congress and their staffs as well as members of the public and supporters of Palestine. The Syrian Ambassador also attended and spoke about the Zionist aggression in Lebanon. In early 1984, I again visited Syria, this time with Reverend Jesse Jackson, during which trip Reverend Jackson successfully sought the release from Syrian custody of the American pilot Lt. Robert Goodman. His A6-E Intruder aircraft from the USS John F. Kennedy was shot down by the Syrian Army on December 4, 1983 while on a bombing run east of Beirut. While in Damascus, we met with President Hafez Al-Assad who released Goodman on January 3, 1984 and we returned to the US together. Another person who greatly influenced my interest in Palestine and Syria during my time on Capitol Hill and subsequently was the late Dr. Hatem Hussaini, the Palestine Liberation Organization’s representative in Washington at the time and member of the Palestine National Council. Hatem taught me a great deal and we became good friends. He used to tell me that he found the American people open-minded and willing to listen to the case for Palestine. I took this as a compliment. I like to think it is the same today with respect to Syria, whose people were among the first large influx of Arabs to America in the mid-nineteenth century and helped build our country. Hatem arranged meetings for me in Beirut and Damascus. He also had great affection for Aleppo. In 1948, Zionist gangs had invaded the Husseini family home in West Jerusalem, forcing his father, a professor, to flee Palestine and take his family to the safety of Aleppo, leaving behind a library of 40,000 books. Another major influence on my interest in the region was the American journalist Janet Lee Stevens, a good friend of Syria whom I met during the summer of 1982 in Beirut and became very close to. A letter to Janet about Sabra and Shatila available through a Google search makes the reasons for this friendship clear. Yet another influence on me with respect to Syria was the very popular Governor of my home state of Oregon, Victor George Atiyeh, the son of Syrian immigrants who became the first elected governor of Arab descent in the United States. During a couple of meetings, although he was a Republican and I was a Democrat, he taught me many things about Syria, her people, history and culture. Always proud of his Syrian background, Governor Atiyeh passed away not long ago at the age of 91. You have written a book entitled Syria’s Endangered Heritage, an International Responsibility to Preserve and Protect and travelled to Syria regularly to document, photograph, research and help preserve its vast and endangered archaeological sites. The main challenges facing Syria’s cultural heritage include the premeditated destruction of the archaeological sites such as in Palmyra, Aleppo and other distressed areas, clashes in the vicinity of the sites, the illegal excavations and the smuggling of artifacts. The UN Security Council passed Resolution 2199 in 2015 to shed light on this issue and Syria’s Directorate-General of Antiquities and Museums has been in regular contact with INTERPOL throughout the conflict to retrieve stolen artifacts. However, in practical terms, what can be done at the legal level both inside and outside Syria to repatriate stolen artifacts that have been smuggled overseas and to bring to justice those engaged in the destruction and looting of Syria’s cultural heritage? This question implies correctly that while UN and other international initiatives continue, the important work of exposing many cultural heritage crimes such as the wanton destruction, looting and global marketing of tens of thousands of irreplaceable Syrian treasures, which are the cultural heritage of all of us, repatriation of cultural treasures and legal accountably to date have been disappointingly meager. Unfortunately, with respect to what can be done immediately, until the war in Syria ends and investigations of areas under jihadist control are able to be conducted, little can be done to hold the criminals responsible. When the war ends and government control returns, then progress can be made on accountability of the sort that was achieved in the Timbuktu case last year. There are currently very few defenses in the field against the destruction of our cultural heritage in Syria. Monitoring and organizing security at potential dig sites are currently largely impractical and of low priority internationally. The Syrian government agency, the Directorate-General of Antiquities and Museums (DGAM), has achieved much in this regard while inspiring many countries to follow its lead. But it remains the case that Syria confronts massive alternative demands on material and manpower for this cause. A number of countries who have been assigned to police the highly profitable illegal trade have been themselves corrupted. Unscrupulous dealers, local and international, are skilled at covering their tracks while even conscientious dealers are being deceived. Even when evidence does arise that a certain artifact was looted in Syria, some museums, institutions and collectors have engaged in protracted legal disputes about their provenance and proper ownership. Consequently, it is often too easy to sell looted Syrian treasures. A recent sting in Beirut demonstrated that while import bans are in effect, with more on the way, law enforcement agencies find stopping them difficult, partly because of the growing number of countries involved and the profusion of middlemen to facilitate illegal transactions. The British and German governments and media have exposed this more than once, but to date few sustained cross-border actions have been taken to stop the trade. Museums, like the general public, have become more alert to probing where certain objects come from and their patrimony, but there is much that must be done across all levels– collectors, museums, the public and local and international law enforcement agencies. Law enforcement currently focuses on seizing and repatriating looted antiquities rather than prosecuting those who loot, traffic, sell and buy them. This approach needs to be changed immediately to make criminals credibly accountable. Given today’s reality that looting excavators in the war zones of Syria are largely beyond the reach of law enforcement, efforts to stop the illegal marketing of our shared cultural heritage must focus on the demand side. Both the sale and purchase of Syria’s artifacts must be the subject of dramatically increased international and individual countries enacting and enforcing criminal laws targeting looters and buyers. Existing UNESCO and The Hague Conventions written decades ago must be strengthened across countries and law enforcement agencies. Legislation pertaining to the global pool of antiquities has been insufficient and must be strengthened. In 1983, the US passed the Convention on Cultural Property Implementation Act, its own interpretation of how the UNESCO Convention should be adhered to. The US measure contains relatively broad powers of interpretation given to a committee of the US Department of State that can decide to what degree other nations’ restrictions on exported cultural property will be followed. This Law needs to be tightened and become a model for other countries to consider. Although public awareness of the attacks on our cultural heritage has dramatically increased since 2014, the frenzy of ISIS’ antiquities destruction compel the UN, individual countries and all of us to expand public awareness of trafficking of our cultural heritage and participate in social media networks aimed towards stopping it. Several countries have enacted laws to increase confiscations of looted and illegally acquired artifacts and to repatriate them as well as hold legally responsible those found in possession of them. All member states of the UN must follow their lead by enacting tough laws to confiscate and repatriate looted artifacts from our cultural heritage. The global public should support initiatives for repatriation of cultural heritage artifacts such as those taken by the Association of Art Museum Directors, which sets guidelines for some 250 members and urges museums to cooperate fully when their holdings are legally challenged. The UN agencies including UNESCO, as well as the UN member states, should clearly declare their support for returning and repatriating suspected stolen artifacts to the lands from where they originated, including thousands from Syria. Some museum directors, archaeologists and collectors support the retention or partage of endangered artifacts unlawfully removed from source countries. In this context, “partage” means sharing Syria’s antiquities internationally with certain countries, as was done under the colonialist-orientalist system put in place mostly to divide up ownership of excavated artifacts during the beginning of the twentieth century. The advocates of partage usually are quick to point out that developed countries would hold the treasures of countries at risk for safe keeping but not in perpetuity. But at least keep them in lockup until a conflict is over and security for the irreplaceable heritage objects can be substantially assured. However, the global community and all of us in our localities should declare our support for repatriation and urge our governments to act. All people of goodwill must reject the excuses being offered: for example, by the former Director of the Walters Art Museum in Baltimore, who is advocating that museums not rush to return antiquities. His reasoning is based on a claimed fear for the safety of the antiquities once they arrive back in the source country. I oppose this concept and have not detected support for it in Syria or within UNESCO. If adopted, it would seriously delay repatriation of Syria’s looted and smuggled antiquities. Syrian officials and scholars interviewed by me over the past few years overwhelmingly reject this point of view as does the Syrian public. There are a few bright signs. International conventions, laws and enforcement have begun a similar evolution. The 1970 UNESCO Convention on the Means of Prohibiting and Preventing the Illicit Import, Export and Transfer of Ownership of Cultural Property gave signatories the ability to seek the return of illicitly obtained cultural treasures and set requirements for collectors. A number of countries are currently passing their own cultural patrimony laws. It will not be easy for our global community to hold all who are looting our cultural heritage in Syria accountable. But we can achieve much if we remain focused on this vital subject and encourage our governments to act meaningfully on their lip service to preserve and protect Syria’s endangered heritage. Very importantly, we as members of the general public must work to keep this critical cultural heritage issue before our peers via social media and other means. You made headlines not long ago in Lebanon for- as you put it- “[buying] four Syrian children off a Beirut street”. As you explained, you did this because the children had lost their parents in the war and the Syrian woman caring for them was their neighbour back in Aleppo but that she could no longer continue to do so in Lebanon. Despite your initial reaction to seek police assistance to save the children, you decided to care for them. Could you please explain what led you to make such a decision? Were you not concerned about the legal ramifications of doing so? Furthermore, what can be done to save Syria’s children and prevent them from becoming a lost generation? As things developed subsequent to this spur-of-the-moment decision of mine to help these lovely children, some distortion of the facts by some in the local media was perhaps inevitable. Thank God the story did have a happy ending and the children are today safe in Syria southwest of Aleppo with relatives. Just a little background as to why I decided to accept the children from the lady who, as a fuller investigation was to reveal, turned out to be a refugee children trafficker and not a relative of the children as she initially claimed. Over the past few years, whenever I had a chance, I would ride my motorbike over to Beirut’s Ramlet El-Baida beach and enjoy the sun and the Mediterranean. I and others in the neighborhood soon learned that “the strip” was a largely non-policed area that Syrian refugee children frequented and sold items such as candy, pencils, flowers, chips and increasingly themselves to earn some money to help support their often destitute families. Consequently, I personally did not have much confidence in the local police, although to their credit, after this incident created some publicity, the Internal Security Forces (ISF) did sometimes send undercover patrols along the strip. Today, they are again largely absent but, after the publicity about the four children, fortunately also absent are most of the erstwhile ubiquitous child predators. In this instance, after looking for a police car, once the woman took the money and left me with the children, I decided to contact Save the Children and UNICEF, who were helpful. Frankly my focus was not on possible legal ramifications but rather on the children’s immediate well-being. Their faces showed they were terrified and I wanted to reassure them. But with the benefit of hindsight, should I again come across a similar situation, I would persist in trying to contact the local police and not take children from the location. All in all, that was an ill-advised spur-of-the-moment emotional reaction that was an error on my part. With respect to what must be done now to save Syrian refugee children from becoming a “lost generation,” it is often said that truth is the first casualty of war. I would agree while suggesting that the Syrian conflict reminds us that for children, the loss of their education is the second casualty of war. From my experience in Lebanon these past few years working with children from Syria, it is evident to me that perhaps the most urgent short-term need of the Syrian refugee generation is for each child to receive daily a hot nutritional meal and their urgent intermediate term need is unquestionably to be enrolled in school. More than 500,000 Syrian refugee children are now located in Lebanon and, according to UNICEF, more than 250,000 are not in formal education, including at least 95% of secondary school-age children. Admittedly, the challenge is staggering. But full enrollment for refugee children is achievable if we join in taking bold decisive action. It is for all of us to help provide education for every Syrian refugee child by assuring that they have a place at school, thus guaranteeing them a future with hope, employment opportunities, security and a chance for a good and productive life. The right of Syrian refugee children to education is a legal and moral right and for their families trying to shield their children from the horrors of war, they should not have to watch them grow up damaged by not having an education. We who try to monitor the conditions of Syrian refugee children in Lebanon are aware that, as more girls and boys arrive from Syria on the streets of Lebanon, rates of child marriage among Syrian refugee girls have doubled, according to UNICEF, from 12% to 26%. We know that child labor among out-of-school boys and girls is also rapidly worsening. One recent survey estimates that a third of boys and girls displaced from Syria have become laborers, often working illegally in dangerous conditions. The Lebanese government to its credit is working to help prevent a “lost generation” and its Ministry of Education has published plans to take 207,000 Syrian refugee children off the streets and give them places in public schools. This has been made possible by the introduction of a “double-shift school system” whereby Lebanese children attend their neighborhood schools in the mornings while in the afternoon and early evenings, Syrian refugee children attend classes in the same schools. This observer recently visited Lebanon’s Antelias Intermediate Mixed Public School which is one of several education centers recently rehabilitated by international organizations and foreign governments in coordination with the Ministry of Education. In the school’s first shift of classes for the day, 353 Lebanese and non-Lebanese students attended; while a further 600 Syrian refugee children attended the afternoon shift. The global community is also trying to help this vulnerable generation. As recently as May 3, 2017, the Canadian government pledged to contribute $45 million to the United Nations Children’s Fund (UNICEF) for education and youth projects in Lebanon that will benefit both Lebanese and Syrian children. With the help of the Canadian grant, UNICEF assured me that there will be increased access to education for Syrian refugee children in public schools. It does not solve the problem but as Canadian Ambassador Michelle Cameron pointed out, “the cheapest way to solve problems in a country is to make sure that children grow up educated– that’s the most efficient way”. But serious problems persist in trying to rescue this endangered generation. For one thing, most local schools in Lebanon are still refusing to accept Syrian children. For another, where fathers are missing, the children must often work to support the family. In addition, many Syrian refugee children are intimidated by having to study in a different educational system and methodology than in their home country. For example, Syrian children are used to being taught in Arabic but many schools in Lebanon teach certain classes in English and French. What needs to be done without further delay in order to allow more Syrian children to attend and to stay in school is for Lebanon to suspend its January 2015 residency requirements on Syrian refugees. These require all refugees aged 15 and older to pay annual residency renewal fees of $200 per person and for those not registered with the United Nations refugee agency, to obtain sponsorship by a Lebanese citizen to stay legally in the country. Lebanon’s harsh residency regulations effectively bar many Syrian refugee children from maintaining legal status– driving an estimated 66% underground and making it difficult for them to work or enroll their children in school. Donors who are subject to appeals for aid from Lebanon should exercise their leverage to ensure that these policies are reversed. Lebanon’s donor-supported refugee education policy does not officially require Syrian children to have residency to enroll. But this is undermined by some school directors who, in violation of the regulation, require Syrian refugee children to provide residency documents and other documents that are not officially required for enrolling Syrian refugee children and that many Syrian families are unable to produce due to the war. Lebanon’s Ministry of Education should ensure that all schools implement the official enrollment policy and hold accountable those who violate the policy. The residency requirements are also exacerbating Syrian refugees’ poverty, because without valid residencies, they are at risk of arrest, which limits their ability to travel in search of informal work. Today, more than 70% of Syrian refugees live below the Lebanese poverty line of $3.84 per person per day and 90% are in debt and cannot pay for transportation to school or depend on child labor to pay for basic needs. Working children often drop out of school and are at risk of exploitation, arrest, violence, and hazardous work. Parents without residency are also afraid to enroll their children if their school is located beyond a checkpoint. The Lebanese Ministry of Interior and the Directorate of General Security should waive the residency fees and sponsorship requirements for Syrian refugee children and allow them freedom of movement. Donors can also have an important role by exercising their leverage to ensure that these policies are reversed. It is well-established that without education for their children, parents see no choice but to leave the region and embark on what have become for so many “death voyages” to Europe. It is also well known that the offer of education is the most important factor in giving previously demoralized young people hope that there is a future worth preparing for. Additional concrete steps can and should be immediately taken to end the risk of a “lost generation”. These include efforts by all of us to encourage donor and host countries to organize multi-year funding, because Syrian refugee children’s education depends on foreign aid and often pledges do not materialize and education needs are routinely unmet. It is particularly important for donors to address the education needs of the most high-risk Syrian refugee children population: secondary-school age children and children with disabilities. Today, in Lebanon, fewer than five percent of Syrian refugees aged 15 to 18 are enrolled in secondary schools and children with disabilities are normally being completely left behind. Another vital action by donors, whether international, local, public or private, is to invest in jobs programs and partner with the private sector to ensure that Syrian refugees, the vast majority of whom as noted above live in poverty, can obtain a living wage and afford to send their children to school. Many families are unable to afford basic school-related costs like transportation or they must rely on income from child labor to survive. The Government of Lebanon, concerned about job security for Lebanese citizens, also restricts Syrian refugees’ access to work. Such measures, which in my view violate international humanitarian laws with respect to refugees, make it very difficult for refugee parents to send their children to school. Jobs programs for Syrian refugees will also build Lebanon’s economy, preserve stability, and ensure that children can get an education. Without immediate action and sustained support, there is a real danger that recent progress in enrolling refugee children will see erosion instead of expansion. The costs of our collective failure will surely include an increase in child labor, early marriage, exploitation, trafficking and the risk of a “lost generation”. These consequences of Syrian refugee children not being allowed an education are morally repugnant and not acceptable to any of us and they constitute a threat to international peace and security. You have written extensively about the illegality under international humanitarian law of US and Western economic sanctions targeting Syria’s civilian population. Could you please elaborate more on this subject? Can Syrians, especially the legal community, challenge these sanctions and if so, in what forum? Yes, I firmly believe these US-led civilian targeting sanctions can be successfully challenged in various legal venues by Syrian lawyers and I have discussed this subject with specialized practitioners at The Hague and elsewhere, including Professor Richard Falk, who agree. These sanctions constitute war crimes also punishable before a special tribunal for Syria with universal jurisdiction, which is virtually certain to be established. But it is not necessary to wait for a special tribunal to be established. Accountability measures should be filed immediately. International and national legal jurisdictions and established tribunals are available where a Syrian-led legal team can file a class action lawsuit on behalf of Syria civilian victims of the continuing US and Western sanctions. War crimes being committed in Syria include economic sanctions that target civilians, the most draconian ever imposed by the United States or any other country. These sanctions massively violate many principles, standards and rules of international humanitarian law, customary law and the UN Charter designed to protect civilian populations during armed conflicts due to their damaging effects on the health of non-belligerent civilians. The severe US-led sanctions regime indeed constitutes a form of collective punishment of the weakest and poorest members of society: infants, children, the chronically ill, and the elderly. US-led sanctions targeting Syria are the face of economic strangulation. History teaches that the claimed targets– the military and political leaderships– will easily insulate themselves from its consequences, and place a disproportionate burden on the civilian population. History also teaches that economic sanctions will consolidate the state’s power rather than undermine it and economic sanctions are unlikely to stop military aggression, or stop human rights violations, or achieve compliance with any political or military demand, even when sanctions drag on for decades. While economic sanctions are rapidly becoming one of the major tools of international governance of the post-Cold War era, I would argue that economic sanctions, like a siege, intend harm to civilians and therefore cannot be justified as a tool of warfare. The history of US-led sanctions demonstrates that they are not a device that keeps the peace and enforces international law. Those who travel in Syria these days constantly observe countless examples of how these sanctions have devastated civilian lives. These effects include rampant inflation, with skyrocketing costs for nearly every consumer food and quality of life items. They are also blocking Syrians from repairing electricity infrastructure, health care facilities, accessing fuel, the transport network and undertaking wider reconstruction. Moreover, it is unlikely that on a specific day, Syria as a whole will move from war to peace. Unless addressed now, the impact of sanctions will last well after the sanctions are either removed or modified. They may also create a new catastrophe in terms of crippling economic and humanitarian effects and war crimes to be judged. To the extent that sanctions deprive the most vulnerable and least political sectors of society of the food, drinkable water, medical care, and fuel necessary for survival and basic human needs, sanctions should be subject to the same international humanitarian legal standards as siege warfare, which I argue should be adjudicated as war crimes. US-led sanctions targeting Syria are imposing an economic siege which the UN claims is contributing to the killing of as many Syrians as those who have died from weapons. The civilian population is dying of illness and malnutrition. There is little doubt that the US-led sanctions will increase quality of life pressure on most people who still remain in Syria. The United Nations and international NGOs working in Syria are also experts on the effects of US-led, civilian-targeting sanctions. A recently leaked report from the UN Office for the Coordination of Humanitarian Affairs (OCHA) in Syria entitled Humanitarian Impact of Syria-Related Unilateral Restrictive Measures (aka US-led sanctions) constitutes a strong indictment of the effects of US and EU sanctions on the civilian population of Syria. Aid agencies cited in the report complain, for example, that they cannot procure basic medicines or medical equipment for hospitals because sanctions are preventing foreign commercial companies and banks from any dealings with Syria. Successful litigation could immediately suspend the sanctions via temporary injunctions and interim orders of protection. Adjudication by the proper tribunal(s) could end many of the US and Western economic sanctions targeting Syria’s civilian population and possibly result in financial penalties payable to Syria’s government to compensate her citizens. Another major benefit for humanity of judicially challenging without further delay these immoral and illegal economic sanctions will be to build on current civilian protections during war and actually create new binding international law on this subject, such that future use of economic sanctions targeting civilian welfare would allow for the prosecution of governments who engage in this behavior. Syrian lawyers, perhaps cooperating with an international team, challenging these civilian targeting sanctions could find domestic and international tribunals with jurisdiction to hear and decide the cases. International legal remedies are available that should be employed to bring relief to them. One is to bring an Application for an Advisory Opinion with the International Court of Justice (ICJ) in The Hague. This is currently being researched by seasoned international lawyers and academics, at various Western and international law centers. Efforts include drafting amicus curie briefs on the issue of the legality of the US-led sanctions to be submitted to the ICJ and plans for securing the widest possible political support for challenging the US-led sanctions from among Non-Aligned Movement countries, international peace groups, NGOs, pro-peace websites, bloggers, social media and online activists. They also include efforts to organize a skilled media center to disseminate information about the case including quickly publishing, in paperback book form, one of the key Annexes to be submitted to the ICJ upon filing the Application. This volume could present Syrian government and international NGO reports on the inhumane effects of the US-led sanctions in all their aspects, including but not limited to children, the elderly and the infirm, plus the effects of the US-led sanctions on the Syrian economy generally: i.e., consumer goods, medical delivery systems, financial institutions, currency values and related aspects of the lives of the civilian population of Syria. Some have suggested there may be potential jurisdictional problems given that Syria has not yet accepted the Article 36 Compulsory Jurisdiction of the ICJ, as provided in the Statute of the Court, but they can be overcome. As a general rule, an Advisory Opinion requires only a simple majority affirmative vote by the UN General Assembly or an application by one of the designated UN specialized agencies. It might be a tough job to secure the former, but it is doable with the latter. Moreover, should Syria accept the compulsory jurisdiction of the ICJ, it could quickly resolve the issue of sanctions by claiming a legal dispute with one or more states that also accept the principle of compulsory jurisdiction and are supporters of sanctions: for example, the UK, France and their NATO and Gulf allies. Under the ICJ Statute, the Court must decide cases solely in accordance with international law. Hence, the ICJ must apply: (1) any international conventions and treaties; (2) international custom; (3) general principles recognized as law by civilized nations; and (4) judicial decisions and the teachings of highly qualified publicists of the various nations. From this body of international law, the International Court of Justice would find ample basis to support Syria’s claims not only for the benefit of its civilian population but also to advance the rule of law in the global community. Were Syria and others to take the illegal and immoral US-led sanctions case to the ICJ and other available venues, they would shift their diplomatic position from a defensive status to taking the offense. Such a bold initiative would advance accountability under international law and, because the ICJ would likely grant a Petition for Interim Measures of Protection, the US-led sanctions could be suspended during the course of the judicial proceedings. Without doubt, this lifting/ freezing of the sanctions would immediately and directly serve the Syrian civilian population, including the half-million Palestinian refugees in Syria as well as thousands of refugees from Iraq. According to several international lawyers I surveyed recently, Syria clearly has the facts of the US sanctions case in its favor and will benefit from solid legal theories in arguing the case before the ICJ. If it agrees, the ICJ could issue restraining orders to prevent any type of blockade or no-fly zones in Syria, compel immediate cessation of economic sanctions against Syria and effectively halt US efforts to secure more sanctions against Syria by the United Nations Security Council. The Restraining Orders, under the umbrella of Interim Measures of Protection, would presumably also seek to prohibit the US and its allies from the Persian Gulf region and elsewhere from advocating and supporting aggressive military actions against Syria (which has included supplying funding, weapons, and jihadists that perpetuate the war, as well as Western “Special Forces” currently pouring into Syria from its northern border with Turkey) and compel them instead to negotiate with the Syrian government in good faith to end the current crisis. In addition to the ICJ, a wide variety of actors– international courts, international tribunals, ad hoc tribunals and UN-assisted tribunals with varying degrees of relation to the United Nations, as well as UN member states concerned about the US-led economic sanctions scheme targeting the civilian population of Syria– could challenge US-led sanctions judicially. One such actor could be the US Federal Court through a class action lawsuit brought on behalf of Syrian-Americans residing in the United States and abroad. When filed in US Federal Court, the Syrian Bar Association and its partners can and presumably will immediately file a motion for interim relief of behalf of Syrian-American clients urging the Court to order the lifting of all sanctions until it renders a decision on the merits of the Syrian people’s case. For example, the legal team could argue to the respective legal authority that tightening US sanctions against Syria in order to achieve regime change is increasingly hitting vulnerable medical patients, as deliveries of medicine and raw materials for damaged pharmaceutical companies are either stopped or delayed, according to medical experts. The various European Court’s rulings on sanctions over the past few years could also provide detailed support in such a case. The Court’s recent rulings should be backed up with evidence, including government data as available, surveys of sources such as owners of supermarkets and commercial suppliers of fuel and auto parts, as well as interviews with medical patients and hospital staff. Through such measures, the Syrian legal community in cooperation with its Bar Association and to its eternal humanitarian credit, could achieve lifesaving relief for Syria’s targeted civilian population and immediately give them hope of some justice. Challenging these criminal sanctions without further delay can achieve an historic advance in international humanitarian law which will greatly benefit mankind. For many Syrians, the true nature of international law has been exposed as a fundamental failure at best throughout this conflict. At worst, it is perceived as a political tool at the hands of Western powers to attempt to enforce certain agendas on states while encouraging selective justice. Syrians are after all witnessing their country being trespassed on by a variety of uninvited foreign powers and their armed proxies leaving a trail of destruction in their wake without any accountability. Is it fair to say once and for all that the body of international law and its institutions developed following the Second World War do not resemble the principles of justice, fairness, sovereignty and so forth in practice? Yes, the global community has failed the people of Syria. The continuing abject failure in Syria to apply humanitarian law, today as throughout this past century, has made the post-World War II principles, standards and rules of justice virtually unrecognizable. The Geneva and Hague Conventions have been ignored and used as political tools by outsiders who exhibit little interest in protecting Syria’s civilian population. Rather, these outsiders are seemingly focused mainly on their own hegemonic projects, with little regard either for Syria’s sovereignty or its post-war future as a truly united nation-state. Yet we must also recognize that many actors in Syria today have also turned a blind eye to the war’s civilian victims. These days, I repeatedly hear a common phrase from Syrian refugees in Lebanon and from the Syrian people across their country: “Syria for the Syrians!” The people of our shared cradle of civilization and the custodians of our shared global heritage are very capable, fair minded, tolerant, and educated and do not need and increasingly do not want America, the Gulf States, Iran, Russia, Turkey, the Kurds, or sectarian militia from Pakistan, Afghanistan, Iraq, Yemen and elsewhere to continue occupying their country. Once the war ends, Syrians have told me countless times that they want to be the ones who govern their 14 governorates and decide who will be their political leaders in Parliament and occupy their Presidential Palace. They are determined to do this without Western or other foreign involvements and agendas. I am often told by Syrians that among the first efforts they must take is to return to the days of secularism, mutual tolerance, and strongly eschew the poisonous sectarianism that they believe was introduced for purely political purposes. US President Donald Trump recently launched a strike against a military facility in Homs province. Though the Trump Administration presented no hard evidence and no independent investigation was carried out, President Trump claimed that the Syrian government intentionally carried out a chemical attack in Idlib province. Is it fair to say that yet another US administration has once again taken it upon itself to act as judge, jury and executioner in the region? How concerned should we all be about President Trump’s apparent reversal on his campaign pledge not to intervene in Syria against the government? Frankly, it’s certainly starting to look that way. Most of my fellow Americans with whom I am in contact find it difficult, as I do, to hold ours heads up and look victims of our American wars we meet in this region in the eye. And many of us have deep feelings of guilt from the fifteen years of criminal wars launched in our names stemming from the Bush Administration’s wars in Afghanistan and Iraq, which have caused the slaughter of more than a million innocents while wounding and displacing millions more. As the questioner is doubtless aware, few among us across this planet of ours have much confidence in predicting what President Trump will do. Much of his campaign rhetoric and promises have seemingly been discarded. He is moving towards policies more like we witnessed during the Bush years. With respect to the Middle East, his many contradictory statements and actions are cause for alarm for several reasons. One is that President Trump appears, unlike President Obama, to be handing our Middle East policy over to the same generals, military establishment and neo-conservatives whose war-mongering mindset, finding fertile ground in the US Congress, has already devastated much of this region. Regrettably, Donald Trump is demonstrating that my country’s leaders have apparently learned nothing from our American military catastrophes in this region, including clear evidence that this region is much more dangerous than it was fifteen years ago when America launched its ill-fated “War on Terror” and that the risk of dramatic and horrific escalations is only increasing. So yes, President Trump’s bombing of the Shayrat base, his threats of more attacks if US intelligence suspects the Syrian government of chemical warfare, and this week his apparent endorsement of carving out of “safety zones”, in violation of Syrian sovereignty, are all ominous signs. They suggest that Trump and his generals expect to reverse many of Obama’s more cautious policies and restore America as the judge, jury and unfettered executioner of the Middle East. These are ominous developments for all of us. When do any of us remember a more dangerous time in this region? How do you envision the conflict in Syria coming to an end? What constitutional and other legal measures do you think will be necessary in post-war Syria to maintain peace and security in the country? Would that it were not the case. Five years ago, I was more optimistic. But as of today, it continues to appear to me that regional powers– sill using proxy militias, as well as their own armed forces, towards gaining political ground in Syria and even, in some cases, supporting hundreds of jihadist and terrorist militia at the cost of countless Syrian lives to date– still believe in and are determined to achieve a “military victory”. For this reason, I do not expect that the war in Syria will end any time soon. Indeed, despite multiple military setbacks, terrorist and other opposition elements appear prepared to engage in long-term asymmetrical, guerilla and attritional warfare with no end in sight. For these and other reasons, I believe the only solution, and the one that I expect will come eventually, will have to be political. It will have to involve the withdrawal of foreign forces and meeting the demands of the Syrian people for a Syria ruled by and for the people of Syria, who must be allowed to choose their own leaders at the ballot box. I agree with a report from the October 2016 University of Damascus Workshop sponsored by the British Syrian Society that the way to end the conflict in Syria will also require an appreciation of the reasons and origins of the crisis and include correctly recognizing the factors that will prompt the non-Syrians combatants and foreign political interests to end the conflict. Once that has been realized, the Syrian people will have the opportunity– and, I trust, the ability– to implement a political process and pursue reconciliation efforts on a larger scale. Looking forward into the future, the political process and reconciliation efforts will have to incorporate plans for greater regime openness and more balanced non-sectarian broader development. Moreover, the general atmosphere of secrecy and lack of information that prevailed before the conflict will also have to be substantially dismantled. Many of these popular and legitimate concerns were in the process of being met by the Bashar Al-Assad government when they were interrupted by the March 2011 hostilities, which to the dismay of most of us have continued until today. Government efforts to address them must be revived. To its credit, the Syrian government continues to seek the implementation of President Al-Assad’s 2013 set of good governance initiatives. It envisages a broader and more representative national unity government that will supplement members of the current government with opposition figures, independents and broad-based citizen involvement particularly on the local levels of the 14 governorates. The new government would then oversee constitutional reform followed by a referendum and then elections. As the excellent 2016 Workshop heard from attendees, Syria is not obliged to adopt a Western-style democracy but rather one based on its own culture and history. What I have been told many times by Syrians themselves– students, officials, lawyers, academics and many members of the general public– is that perceived and real injustices must be addressed to assure that the Syrian population supports the settlement. As those of us who have spent a fair bit of time in Syria know well, the Syrian people, including those who had to flee Syria as refugees, are numbed, exhausted, disdainful of politics and want to return to Syria and to their homes and begin rebuilding their shattered lives. Just last week, a student at the University of Damascus advised me, with respect to the immediate future of the Syrian people: “Our main focus should be to keep encouraging the unique spirit of the Syrian people: to be there for each other; to stick together– to get us, the Syrian people, on the long road to healing”. It may well be the case that a stable political settlement will have to include some type of amnesty and an accountability process, possibly drawing from precedents such as South Africa’s Truth and Reconciliation Commission (TRC) or the Gacaca (People’s Courts) of Rwanda, that allow the Syrian people some restorative justice. In other settings, civilians who were victims of gross human rights violations have given local public statements, including before the growing number of local Syrian “Reconciliation Committees” about their experiences and some have addressed national hearings. Perpetrators of violence could also give testimony and perhaps obtain amnesty from both civil and criminal prosecution. Although a painful process for many people to contemplate, such measures can sometimes go far in healing even the deepest grievances if they draw on local cultural ideas about justice and fairness. I would add that it is essential that the Government of Syria take full control of its own affairs. That means complete Syrian control of all post-war construction, from restoring our shared global cultural heritage that has suffered much damage to fixing the damage to public infrastructure. Billions are expected to be contributed from abroad, but it is vital that Syria not cede any sovereignty to foreign powers. Syria’s national territory is the birthright of the Syrian people and this fact must not be negotiable. Finally, I would offer one last suggestion– as we hopefully progress soon to end this horrendous conflict in Syria– that the legislative initiatives contained in the Syrian Law Journal’s report and proposed by the British Syrian Society-sponsored Workshop become a vital part of this process.